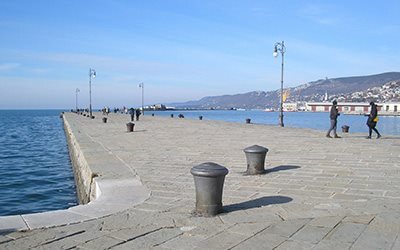 History for children - Patron Saint of Trieste: Who was San Giusto?.. Giusto was a citizen of Aquileia, (a town not far from Trieste), who lived in Roman times during the empires of Diocletian and Maxentius and converted to Christianity. At the time, to refuse to worship the Emperor of Rome was a crime, to worship the Father of Christ was even worst! The local Governor Mannacio, called all citizens and ordered them to declare their faith in the Roman Emperors and renounce Christianity. Failure to do so would be punished by death. When Giusto was called, he did not behave with hostility or as a rebel: he was loyal to the Emperor but could not worship him, because he believed in an other God... To give him time to reflect on the situation, and choose between his God and the Paganism, Mannacio had him jailed. Giusto, however, did not change his mind and was inevitably sentenced to death. On Mannacio's order he was thrown in the waters in front of Trieste, tied to heavy weights that dragged him down to the bottom of the sea. Then something incredible happened: the ropes came undone and his body emerged from the water and was swept ashore. A priest and a group of Christians recovered his body and buried it. In the 5th century, his body was transferred on a hill, San Giusto Hill, where a Christian Basilica was built in his honour and he later became the patron saint of the city.